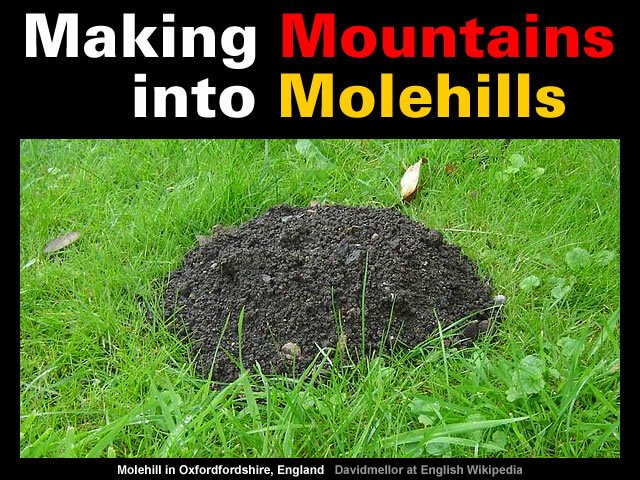 Making a mountain out of a molehill is an idiom referring to over-reactive, histrionic behaviour where a person makes too much of a minor issue. Unfortunately, deploying this metaphor [implicitly] informs your opponent you are in a defensive position and “on the back foot”. 2. (idiomatic) in a defensive posture; on the defensive; off balance; at a disadvantage. A far more effective strategy in the information war is for authority figures to control the topics other people discuss by setting the agenda. Politicians, journalists, academics and many others specialise in setting the agenda. One very effective diversionary [and offensive] tactic that’s deployed when setting the agenda is to misdirect the audience so that [metaphorical] mountains become molehills. In the realm of academia the greatest existential threat to their snug sinecures and tramline thinking is [very appropriately] the concept of Extinction Events. Such an event is identified by a sharp change in the diversity and abundance of multicellular organisms. The academic authorities understand that Extinction Events require very careful management because they have the potential to devastate many consensus theories that are deeply embedded in the disciplines of astronomy, biology, geology, history and physics. The academic authorities also understand that Extinction Events are very much like Death Certificates in so far as games can be played by misdirecting and muddling the debate regarding the Immediate, Intermediate and [especially] Underlying Causes. Accordingly, academic authorities enthusiastically encourages a diversionary [and diversified] agenda focused upon the Underlying Causes of Extinction Events. But Wignall (2001) concluded that only five of the major extinctions coincided with flood basalt eruptions and that the main phase of extinctions started before the eruptions. ● Sea-level falls: 12, of which seven were associated with significant extinctions. ● Asteroid impacts: one large impact is associated with a mass extinction, i.e. the Cretaceous–Paleogene extinction event; there have been many smaller impacts but they are not associated with significant extinctions. A wonderful example of this diversionary [and diversified] agenda playing out is a recent article that emphasises the asteroid and volcanic extinction explanations [Hat Tip to CW]. A Princeton geologist has endured decades of ridicule for arguing that the fifth extinction was caused not by an asteroid but by a series of colossal volcanic eruptions. But she’s reopened that debate. What turns a Disaster into an Extinction? Why didn’t the survivor population recover? In the natural course of events there are survivors on the periphery of every natural disaster that [eventually] repopulate the disaster zone. Completing the Extinction Certificate for any natural Extinction is difficult. The Extinction Certificate for the giant millipede is a challenge because it needs to include the Immediate, Intermediate and Underlying Causes of extinction. Arthropleura is a genus of extinct millipede arthropods that … ranged in length from 0.3 to 2.3 metres and a width up to 50 centimetres. This is an invalid Extinction Certificate for the giant millipede. The problem being that this Extinction Certificate could apply to any life form. It doesn’t address why the giant millipede was specifically destined for extinction. Life forms don’t survive when the environment doesn’t support their life form. Stephen Hurrell realised large dinosaurs couldn’t survive when gravity increased. The strength of leg bones necessary to support the mass of today’s life has been measured by a number of researchers (Anderson et al, 1985). Researchers have also estimated the body mass of dinosaurs based on the volume of these dinosaurs (Colbert, 1962). Since leg bone strength will be weaker in a reduced gravity, the gravity at the time of ancient life can be estimated from fossil leg bones. In general, the body mass estimates based on volume methods greatly exceed those based on leg bone strength. This variation between the body mass estimates and the leg bone strength can be used to roughly calculate ancient gravity when the ancient life was alive. Ligaments are not fossilised but the size and shape of dinosaurs’ bones have been used to estimate the strength of the neck ligaments of Diplodocus (Alexander, 1989). The gravity at the time of ancient life can be estimated from the strength of neck ligaments. The variation between the actual strength of the ligament and the required strength of the ligament can be used to estimate the relative scale of life and hence roughly calculate gravity when the ancient life was alive. The relative scale of ancient life can be estimated from the blood pressure of ancient life. Blood pressure is proportional to blood mass, gravity and height so it is possible to calculate blood pressure in ancient life and compare this with the blood pressure of modern life. The Extinction Certificate for large dinosaurs based upon the work of Stephen Hurrell would read as follows. The Extinction Certificate for most ancient aquatic species is very straight forward once it’s recognised that aquatic fossils are only found on dry land. Thus an ancient historical narrative begins to emerges of an inflating Water World which was once covered by a network of interconnected inland seas. These inland seas have since [in the main] drained away into the [recently created] oceans basins leaving behind isolated lakes [many of which have evaporated away] and some isolated populations of seals. The beastly Basilosaurus has been banished to “30 to 40 million years ago”. And the dreadful Dorudon has been dispatched to “40.4 to 33.9 million years ago”. 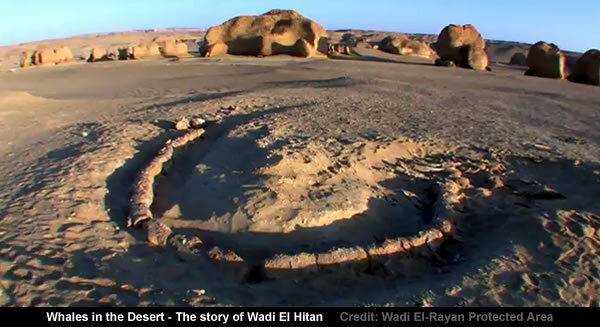 The remains of this dangerous duo that “lived in warm seas around the world” have been found in the dessicated desert of Wadi Al-Hitan – West of Faiyum in Egypt. These Extinction Certificates follow in the footsteps of D’Arcy Wentworth Thompson who very effectively threw Newton, Darwin and a whole host of academic acolytes under the bus when his On Growth and Form was published in 1917. The central theme of On Growth and Form is that biologists of its author’s day overemphasized evolution as the fundamental determinant of the form and structure of living organisms, and underemphasized the roles of physical laws and mechanics. Thompson pointed out – in example after example – correlations between biological forms and mechanical phenomena. By focussing upon the Underlying Causes of Extinction Events the mainstream has very effectively set an agenda that diverts and misdirects the audience. Under their guidance the vitally important issues of the Intermediate and Immediate Causes of extinction have been sidestepped and metaphorically made into molehills. Another century of academic inanity beckons unless this agenda is altered. Gallery | This entry was posted in Catastrophism, Geology, Inflating Earth, Science, Uniformitarianism. Bookmark the permalink. down to only a few tens of thousand years at most. Great dazzling last two works, thank you Tim! Extinctions “of the human kind”, and the reasons for their coming about, were something I had just been contemplating. These may be linked to the subject of this thread, in that the Primary Cause may be one and the same, albeit the possibility that it manifests itself in different ways. Since in my case there have been repetitions far more frequent than asteroid impacts, the latter case may not hold. In respect of volcanic eruptions, like tsunamis, these are secondary effects and there might be a likely progenitor cause. Recent research was investigating the possibility of human annihilations in the not too distant past, namely the last 10k years. The immediate common cause were tsunamis. Collateral damage involved other creatures as well (the Eternal controller makes no distinction – it is after all variations on a common skeletal theme). However the primary cause I point to an Earth characteristic first identified by J F Dodwell, but now the evidence mounts. We may be still far from a decent understanding of where we stand. Ps. One small point on changed earth gravity, and its effects on dinosaurs. A doubling of gravity on load on leg bones is same as doubling of weight. Human obesity indicated that this is not a direct cause of leg related death. Skeptical here. “A doubling of gravity on load on leg bones is same as doubling of weight..
Stars are made and confined by plasma pinches. Remove the pinches and there will be expansion. Same mass, different volume, surface area and gravity. In an exit from a star pinch, there will be mass added and lost. The added mass is mostly protons/hydrogen ions. Water and ammonia result. The lost mass is due to the sharp delineation of the pinch(es) which means the pressure on the tangential point of a sphere is enormous, but rapidly declining. The tsunami resulted from the additional mass, the eruption of hot water from ringwoodite and the alteration of planetary spin, caused by the expulsion and the jet of the mass leaving to form the moon. The latter also tipped the orb into a 25+ degree. wobble which is still declining. This is all commemorated in the Orb and Sceptre. These events have been deduced before now. But it was decided to cover them up. Millenial madness caused many disruptions, demonstrating that demagogues and panic would rupture the fabric of a civilised society. We may now expect another expulsion, like that of Venus, which gave rise to the events recounted in Exodus. The timing is not known, but planetary alignments will likely play a part. I term the expulsion from Eden the Great Catastrophe and the Venus one as the Small catastrophe. The locking of the darkside of Venus to the Sun, at inferior conjunctions, shows a strong link betweeen Earth and its sister. The next inferior conjunction is late October, 2018. I expect particularly atrocious weather then. In January, 2022, the Earth is closest to the sun and that inf conj may produce the Phoenix? The hole in my hypothesis is that a transit of Venus would surely be a more potent trigger and these occurred in 2004 and 2012. We will all be dead before the next transit, barring planetary realignments….! – The added mass is mostly protons/hydrogen ions. Water and ammonia result. made up mostly of a water/ammonia mix. expulsion and the jet of the mass leaving to form the moon. ==> a) This is an elegant unheard of process concerning the tsunami. charge triggers an expulsion of mass to form a smaller companion? – This is all commemorated in the Orb and Sceptre. ==> I was not aware of this commemoration: any link or data on this? Scaling up a design has its pitfalls (in eng. at times with prohibitive costs). But it does not quite work that way. Here’s an example from real life, based on my experience as young peasant/older mechanical engineer. A 4-legged donkey spent its life pulling a loaded cart; load not much less than donkey’s weight. To pull cart uphill donkey uses hind legs as fulcrum, the configuration of forces being at a rather obtuse angle. So loading force in hind legs is greater than donkey + load. To move along donkey shifts load continuously from one leg to other, therefore leg-load doubles. Since steps are like impacts -not soft- eng says infinitely small impact at minimum doubles instantaneous load (important in eg. sling design/choice). In other words nature’s design has a large built in safety factor. Based on simplistic aeronautic design rules, a bumble bee cannot fly. The pterodactyl did not fly because it was at 1/2g, but good aerodynamics and skeletal weight optimisation. Plus good bird pre-flight training; – excrete before takeoff. Of course this is a minefield of an area. However, Occam’s razor works most times.